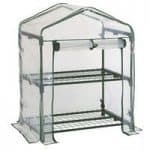 When space really isn’t on your side, this Waltons Mini Cold Frame could be the perfect solution. 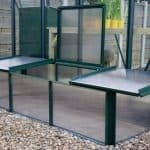 Ideal for those who cannot fit a full size greenhouse in their garden, this little growing area is both compact and affordable. Made from Baltic sourced pine, the cold frame has a very sturdy, long lasting design. 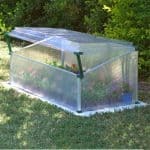 Complete with an opening window lid, it is quick and easy to gain access to your plants. The unit also comes with a 10 year anti-rot guarantee to highlight its excellent longevity. Its modern design means it will blend in perfectly with your existing garden design. Styrene glazing is used on the lid for a safe, shatterproof finish. This makes it a fabulous choice for those with young children. Whilst you cannot grow a huge amount of plants in here, it will be more than enough for the amateur gardener. Much like full size greenhouses, this doesn’t comes with a floor. So if you don’t have a concrete base available it will need to be constructed on either a timber deck or patio slabs. This is an extremely affordable and compact unit and benefits from a delightful modern design. Waltons is one of the leading manufacturers in the industry so you are guaranteed excellent quality. Its floorless design means it does need to be built on a solid surface. However, it allows for heavyweight storage and allows you to plant and water plants without worrying about damage to the floor. This is a mini cold frame, designed to fit into even the smallest of gardens. Cold frames are built low down to the ground and come with a transparent lid. You can see from this model that it is one of the smallest cold frames on the market, measuring in at just 10 inches tall. 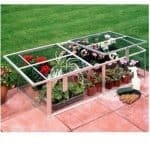 It is basically a very miniature greenhouse and would suit those living in a flat or apartment with either a small balcony or a very small garden. The roof of this cold frame is created from styrene glazing. This is 100% shatterproof so if you have pets or children you don’t have to worry about the risk of injury if it somehow gets broken. The glazed lid allows sunlight to get to the plants, whilst also preventing heat from escaping. It has a sloping design so rainwater will literally just roll right down onto the floor. This protects the unit from rot and ensures it lasts for many years to come. There isn’t a floor and this is largely due to practical reasons. You’ll likely be potting and watering the plants directly in the cold frame. Obviously if it were to contain a wooden floor, the water and soil spillage could cause a lot of damage. However, this obviously means that you’ll need to install the unit on a solid surface, ideally concrete based. If you don’t have a concrete area, we would advise placing paving stones down. It’s only a small unit so this won’t be expensive to do. The majority of the cold frame is constructed with high quality Baltic sourced pine. This gives it a very rigid design and ensures it won’t be easily broken down. Most of the unit is made from single panels, thought the back is constructed from two panels due to its increased height. This means it is very easy to assemble. It also has a tight interlocking build to make sure heat stays inside and there is no risk of drafts or water seeping through. You can see that the corners of the cold frame have been well framed. The frame is really thick and provides fantastic support for the structure of the unit. Like all wooden buildings, this will need to be treated. We highly advise you treat it with a spirit based treatment once constructed and then every year after that. The spirit treatment will penetrate into the wood and form an internal barrier, as well as a surface barrier; ensuring the unit is extensively protected throughout the year. However, if you’d like to change the colour of the unit, a water based treatment would be better. They come in a much wider range of colours, but will only provide a surface weatherproof barrier. As this is simply designed to grow plants in, it isn’t fitted with any form of security. The lid has a heavy design so it doesn’t require even a turn button catch to keep it securely closed. Even though there isn’t much chance of someone trying to steal anything from this cold frame, you could always add a lock yourself. This would require some DIY skills but a padlock could be installed if you feel it’s needed. As the lid is transparent, your plants are clearly visible so it doesn’t have any privacy either. 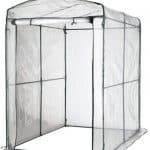 Greenhouses and cold frames aren’t designed to be private and they need to have a fairly transparent design in order for your plants to thrive. The only way you could really customise this cold frame is if you were to change its colour. You can do this with a coloured water treatment. That way you would be personalising the unit as well as protecting it against the weather. As it is such a small unit, there aren’t a lot of extras you can really purchase. Waltons offer a range of Draper accessories that you might be interested in however. Draper is a leading manufacturer of outdoor tools and equipment and here you have four different extras to choose from. There’s weed control matting, a trowel and steel fork set, kneeler and seat and a garden recoil hose kit. So if you’re new to gardening, these could definitely be worth considering. The unit comes with a 10 year anti-rot guarantee, though it will need treating annually to ensure it withstands the UK’s unpredictable weather. This is a very small unit so you aren’t going to be able to grow a huge variety of plants. However, you’ll easily fit 3-4 plants in here depending upon their size. It’s not going to take you long to put this little unit together. It’s very simple to self-assemble and requires very little effort. Though it doesn’t come with a long list of features, this cold frame does offer great value for money. It’s sturdy, long lasting build ensures you really get your money’s worth. Final Thoughts: It isn’t always possible to benefit from a full size greenhouse, but there are still ways you can grow your own plants. This 2’x3’ cold frame is a fantastic, space saving unit that allows you to grow a small range of plants. It comes with extremely easy access thanks to the opening window lid. This is glazed with styrene for safety purposes and will not shatter if it gets broken. The unit is so compact it will fit into any garden. What’s really impressive is its high quality wooden design. 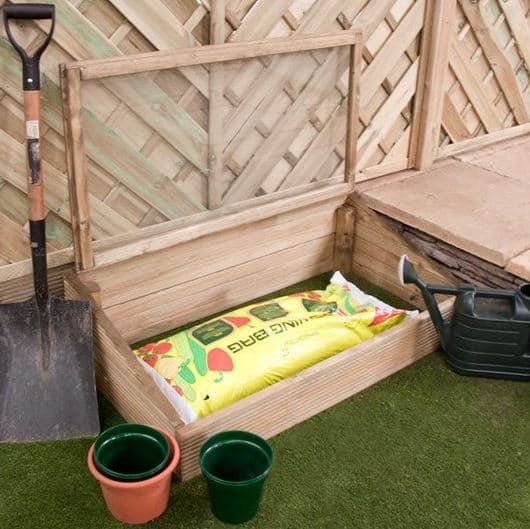 Built from Baltic sourced pine, this cold frame benefits from a 10 year anti rot guarantee.